Gigi turned out to be as much use as a chocolate fireguard. Did you contact motosport62 near Lille? I think they are very able to service your Tesi 1D. Try also with Bimota Gelain in the east of France. They still service Bimotas they imported in France some time ago. I can give you their phone number if you want. Thanks I will check them out on line. Would actually rather do the service myself but if they can point me in the right direction that would be great. I have started to strip it and the more I look at it the more it looks like you have to get the motor out of the frame to get to the belts. Yes you will have to strip the whole bike to change the belts. A nightmare. Do you have the Tesi workshop manual? I have started so I'll finish. Yea I figured the more I looked at it the more it looked like it needed to be taken apart. The joys of Bimota. Know what though. I am gonna do it. I want to ride it and I love the look on people's faces when they see it. I will take my time and when I'm done I'll be happy. Thanks so much for responding, more than Bimota did. It took me the best part of two hours to get the air box off this afternoon. Can't get your hand in to get the screws off the front intake. Yea Nightmare. I have taken loads of pictures so I can get it back together again. I don't have a TESI workshop manual, I didn't think you could get them but I did get a Ducati workshop manual for the motor. Perhaps you could upload some pictures of the different steps disassembling the bike and post about your difficulties and surprises/discoveries this will bring to you ? I've found with Bimota, (at least the YB series), the best approach is to pull them down to individual pieces. Clean, grease and polish (I don't mean buff) as you go. Take lots of photos as you pull it down so you can get it back together. Engine wise do all the watercooling orings, check water pump, valve clearances, new gaskets for valve covers, replace engine hoses, service the carbs etc etc. Don't skimp and you will have an as new bike that will do another 20 years without issue (well maybe). It seems to take forever, but you end up with something that you know and can trust. Cheers. I've got 42 photos so far. Hasn't been any real problems. Getting my hand and an allen key inside the air box to get that off was a pain. Nor going as fast as I would like as work takes over. Going to replace the coolant lines and fuel lines. Not sure how many more photos I'll have. The front end is going to have to come off and most likely the rear. Not looking forward to that. Am looking forward to getting it finished so I can ride it. There are now 67 photos of the strip down. 107 mb if anyone wants a copy drop me a line. No they don't. The battery cannot be removed from it's carrier unless you remove the tubular sub frame first. 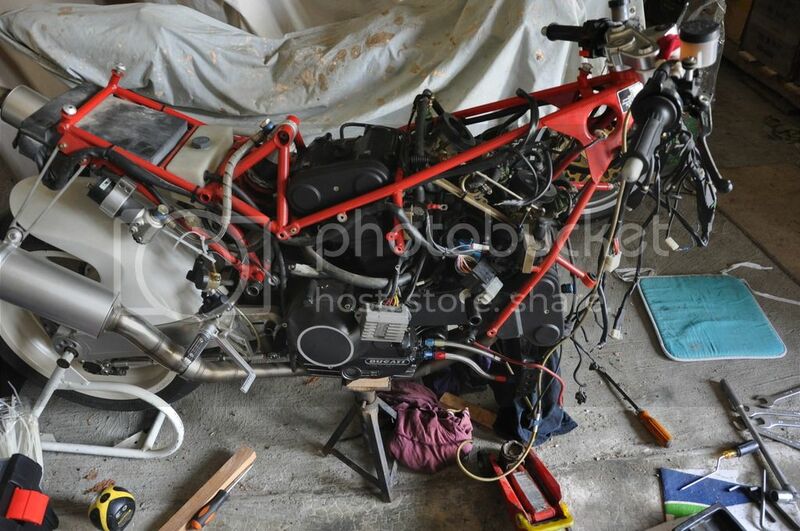 This entails dismantling most of the top of the bike and the steering. but then I didn't require all the electrical items that are mounted on it. Thanks but you are not quite correct. I'm fitting a new battery but you don't need to dismantle everything to get to the battery as I have taken the battery out before and you only have to take off the bodywork. Just about there. Waiting for the bits and the tension tool to turn up. The top red trellis bit needs to be unbolted to gain access to the belts.